10 years ago when I first arrived to Korea, I went on a day trip to Busan with a friend who was interested in photography. We ended up in a place that had camera shops stacked almost on top of each other. 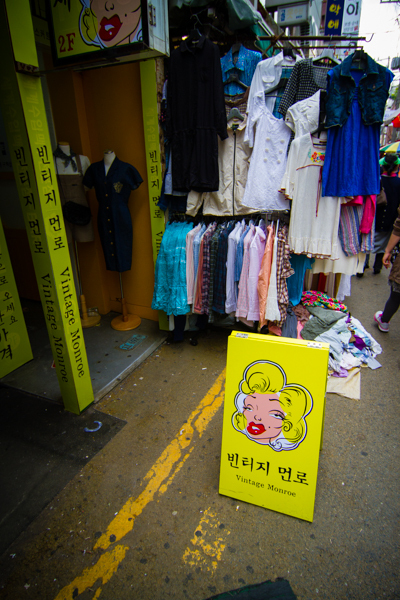 I thus named this area “Camera Street” and proceeded to spend millions of won there. Years later, this moniker does not fit. 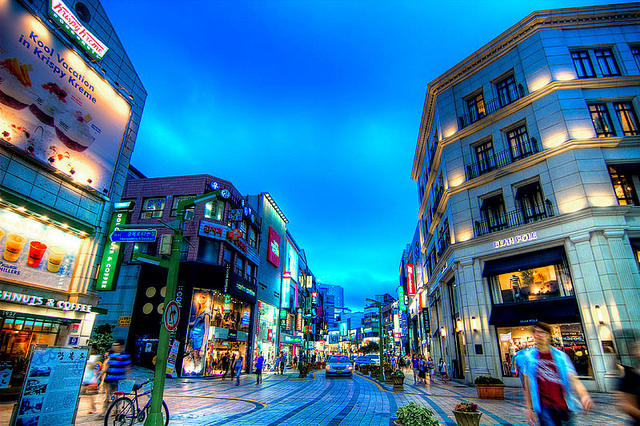 The camera shops have disappeared and have been replaced with upscale clothing stores and trendy cafes. What used to be a grungy area full of middle-aged men with expensive cameras is now filled with young couples with expensive cell phones. So what makes this place any different than all the other shopping/touristy places in Busan? Why would you want to spend a few hours on a Bus or a train to get there? Well, here are 10 reasons, in no particular order, to visit. For those who are looking for a unique shopping experience or are simply looking for some cheap used clothes. The vintage market is for you! The easiest way to find this ally is to he to the main intersection of Nampo-dong. This intersection is marked with a large statue thingy, head past that and turn right at the KFC. Walk up a few hundred metres and turn left you will see all of the clothes hanging on racks in front of the shops. 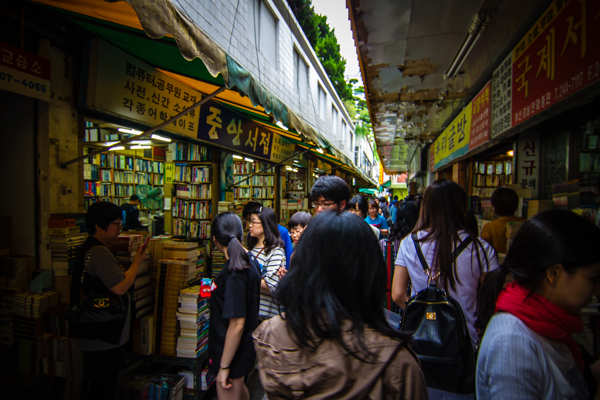 One of the most interesting places in the area is the book alley as it has a ton of great little shops that sell books but sadly only one sells English books. However, the area has a great vibe and there seems to be new coffee shops popping up all the time. This is much like the rest of the area (and Korea) but these have a more artsy feel to them. The actual alley is small and the biggest problem is that it gets full of people easily. Thus means a bit of pushing and shoving going on. If you can handle that, then it is a great place to poke around and see what you can find. What started as a market to sell leftover food items from the US military after the Korean war, this area is packed now with cheap market items, different “imported” foods and alcohol. Take the “imported” a bit lightly as I have found that there is nothing new there besides what you can find in local shopping marts. The area does get packed with people quite quickly and again the gentle pushing and shoving ensues as well as the occasional ajeoshi on a scooter trying to navigate his way through an alley that is packed with people. It is said that there is an “international Market” there but again it is nothing special. This alley that runs up from the KFC is a mixture of knock-off goods and delicious food. 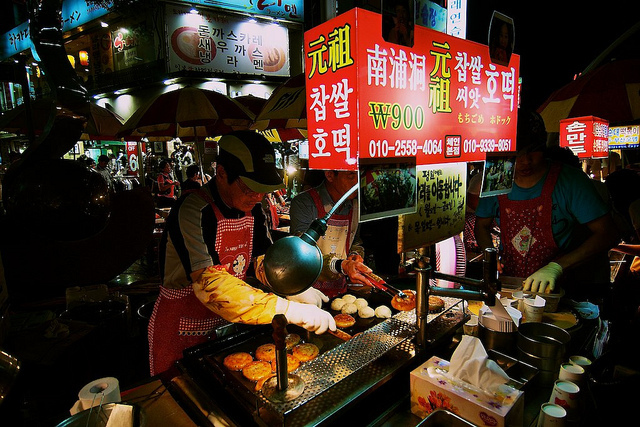 This area you can get some delicious heott-ddeok the sweet korean pancake and some great bibim mandu. Also this area is packed with places to get knock off fashions and goods. Again, this area is packed with people and it will give you a headache trying to get from one end of it to the other. For a good view of the city, this is the place to go. 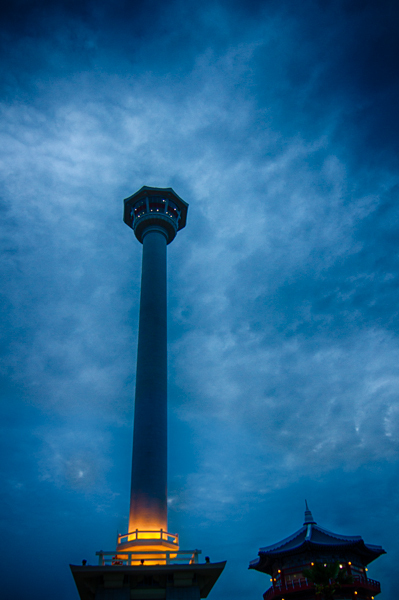 While I don’t normally head up to the top of the tower that often it is nice to do once. However the “free” view from the roof top viewing area in the nearby Lotte Department Store is just as good and there is even a coffee shop there too. However, the grounds around the tower are nice and you can just sit back and relax a bit. I must admit that I shed a tear each time I hear this area called “fashion street” as it used to be “camera street” at least to me. Back in 2003, this area was made up of a ton of camera stores and a/s centers. Now, many have moved down to Seomyeon and the buildings have since become the homes of the latest brand name clothing outlets and coffee shops. There are some decent cafes and even an apple retailer and a/s center. It is not the grungy place it used to be and the area draws thousands of people around Christmas time for its annual lights festival. One of the messiest burgers around but surely one of the tastiest. This burger shop as delicious as it is busy. 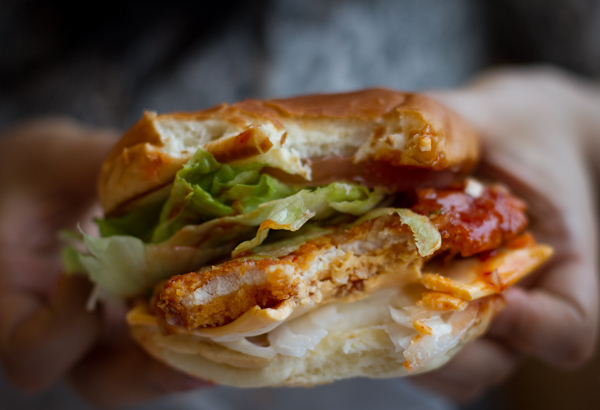 It serves up a traditional American style burger as well as a great chicken burger. This is a shop that I have wanted to try for some time and finally went. Now, it is not the best but it is decent place to hit if the great street food around the area is not to your liking. Each time I hit Nampo-dong I have to pick up coffee from JM Roasters. It is one of the best and reasonably price roasting cafes in the city. They also roast some great beans and really know what they are doing. The Nampodong location just past the tourist info centre and it is a quite large building offset from the street. Their coffee is second to none and that is why they typically get a little busy at times. Look for the centre/ main intersection of the “fashion street” [a tear has been shed] and you will see the tourist info place. Then walk past it a short distance. You have seen this sweet pancake around but not like this and surely not this tasty! 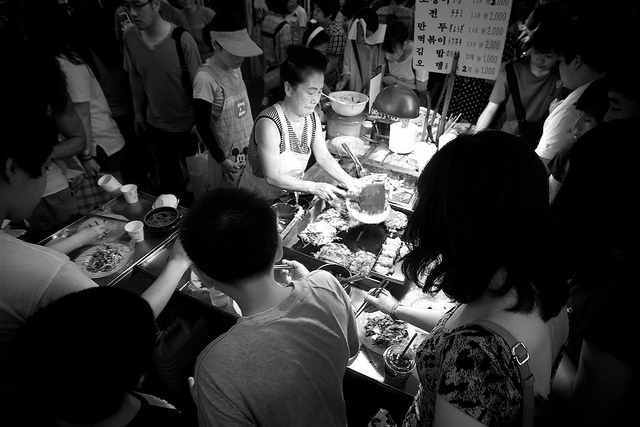 If there is one food that this area is famous for it is the shi-oht heot-ddeok. 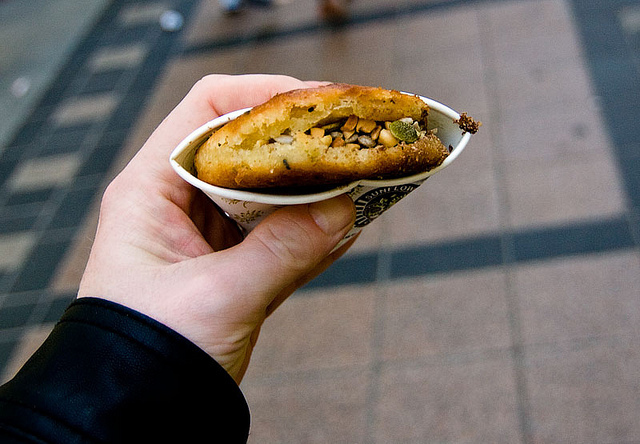 It is your typical korean pancake but filled with brown sugar and nuts. They are in one word; amazing! To just just how famous they are the one shop pictured here had at least a 45 minute wait just to get the pancakes! The best one is located in from of the Cinema and it is the second stall in. Just look for all the people and line up. They are about 1,000 each(despite the photo that says 900 won) now, but they are worth it! There are still a few camera shops left in the area and they are located at the beginning of the street near the Lotte Department Store. Ilkwang Camera is my personal favorite. They are trustworthy and have good prices. Now, the one thing that you should know is that they are not going to give away a $5000 Canon EOS 5D MKIII for 200,000 won! Basically these shops are for people looking for decent camera equipment that you can’t find in Ulsan. These are not the black market shops that you are looking for. They are just dedicated camera shops that have a lot of great gear. If you want deals check online. The best way to get to nampo-dong is to take the train to Bujeon Station and then hop on the subway to Nampo-dong. For me this is the fastest way. However you can also take the train or bus to pretty much any point in Busan and then hop on the subway to Nampo-dong. A good starting point would be to take exit #7 and then take a left you will be technically at the beginning by the camera shops and then you can head down the street from there. However, getting out at exits #1 and #3 are fine, but you will have to head right (with the big street on your left) and then cut through the alley to get the the “fashion street” [another tear shed].